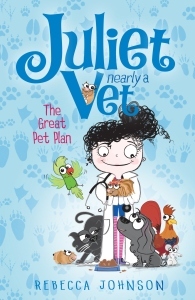 Juliet Nearly A Vet Book Series - Review & Giveaway! The Juliet Nearly A Vet book series is written by Australian author Rebecca Johnson, and illustrated by Kyla May. There are 12 books in the series so far, with the latest one, Rainforest Camp, released earlier this year. I read the first book in the series, The Great Pet Plan, with my youngest daughter, and we both really enjoyed it. I'll be giving away a copy, so keep reading to see how you can win! Juliet is ten years old and she wants to become a vet, just like her mum. Along with her best friend, who happens to be her next-door neighbour, Chelsea, she devises a plan to have a 'pet sleepover', so she can practise looking after animals. But she doesn't mention this to her family! And we find out, that even though Juliet and Chelsea have the best intentions, not everything goes to plan! The books are targeted at an audience of 8-10 year old girls, but my 6 year-old daughter adored the story, she comprehended it well, and could read most of the words. She also liked looking at the black-and-white illustrations throughout the book, and reading the tips and hints that Juliet writes in her Vet Diary. We are looking forward to reading more books from the range. And with thanks to Rebecca, I have a copy of The Great Pet Plan to giveaway! Or what does your child want to be? 1. This giveaway is open to residents of Australia only. Total prize pool $9.95 plus P&H. 2. Giveaway closes on Friday 16th September, 6 pm; winner will be contacted via email within 48 hours. Failure to receive a response from the winner will mean the prize is forfeited and a new winner will be chosen. Disclaimer: I was given two books from the Juliet Nearly A Vet in exchange for an honest review. I was not paid for this review. All opinions are my own, and not influenced in any way. I wanted to be a florist, I have always been fascinated by flowers and the variety of smells, shapes and colours they offer. My 7 year old daugher wants to be a farmer and remain a "Miss" forever! My 5 year old boy wants to be an alien when he grows up (because he wants to live on the moon). My 2 year old loves making all of us laugh so, while he's too young to tell me, I think he will be an actor! When I was growing up I wanted to be the first female Prime Minister (never happened ;)). An author (and I still do). Ever since I learned to read and write, I've had a passion for creating stories. Although I've never published anything, you never know. Same here Sarah! Thanks for entering and good luck! I wanted to be either a secretary or a vets assistant. Not sure why I didn't want to be either the boss or the vet, but there you have it. As luck would have it I ended up spending 13 years of my working life as the Senior Executive Assistant to the Australian Chief Veterinary Officer. So I got both! LOL. I also wanted to write books. Seems like I managed to nail that one too. I love the sound of this series. It sounds like our little 10 year old vet and our little 10 year old cheerleader could be friends! How interesting to read that you actually got to do what you had wanted to as a child! I wonder how often that happens! It is a great series, there are so many beautiful books around, our children are spoilt for choice! Both my girls would love this. When I was younger I wanted to be an astronomer - all because of Halley's Comet! It's actually cool that my son has a strong interest in space now as I get to revisit all the facts again too - I never did completely outgrowm my interest! My oldest girl wanted to be a Parasaurolophus, then a Paleontologist, now she's 14 and wants to write books about dinosaurs. She loves her extinct reptiles! The two boys want to be trains, and my younger girl wants to be a princess. Fantastic career choices!! :) Good luck, and thanks for entering! Sorry Deb K, I accidentally deleted your original entry! The rescuing, the adventure of putting out a fire, and most importantly, driving a fire truck! My daughter wants to be a farmer and dog breeder and sell her produce at markets. I wanted to be an artist and have exhibitions and have a studio that I slept in. I am a landscape designer and I paint as a hobby. I guess au sleep in my garden, just in the house. Miss 5 wants to be tall like me she can be a mummy! So cute! Good luck, and thanks for entering! Growing up I wanted to be famous! It didn't really matter what for. I just knew I wanted people to know my name. My 7yo on the other hand wants to fly... she just hasn't figured out how yet. My daughter Giselle is 7 years old and she would like to be a vet, when she grows up. I wanted to be an ice skater! I was enamoured with Jane Torvill and Christopher Dean, UK Olympic gold medalists and world Champions thought the 1980's. Unfortunately, I have suffered from dizziness and vertigo for most of my life, so I was never able to fully master those twists and spins! Growing up, I wanted to be "Nearly A Vet"...as I desperately wanted a cuddly pet! But as I grew up I started to read...and thought a librarian would be a good job indeed! Then I started playing the flute...and thought an orchestra would be a hoot! Now as a teacher and a mummy of 4...I'm so happy and couldn't ask for more!